There’s a better way to ensure your emails with your headshot and resume gets seen by your intended target, and doesn’t drop into the spam chasm. A simple solution that is user friendly for both the sender and receiver. A solution that has casting or a representative doing one click: opening your email. The spam algorithms of nearly all major email services (Gmail, Yahoo, Outlook, and the antiquated AOL) automatically dump emails from “strangers” to a recipient into the recipient’s spam folder. Gmail has the largest wall protecting its borders against spam. Once Gmail detects what the algorithms suspect is an alien email with an attachment the email is deported to a hidden folder unseen by the recipient. Besides the spam folder abyss; attachments cause recipients to avoid opening attachments for fear of viruses contained within the files. Your target deletes your precious email without their opening your message. Insert a thumbnail image of your headshot in the body of your email (following your signature). Create an industry-standard formatted resume in a table using a word document program. Tables ensure your resume remains neatly, industry-standard formatted upon the email being opened. The full-width email version of the resume is to be 5 ½ inches. NOTE: Studies reveal that the average, smallest width of an open email desktop browser window by a user is 5 ½ inches to 6 inches. Make the resume table’s cell borders invisible by either using the “No Borders” option, or having the borders all colored white. This way the nasty, unattractive black lines won’t show or print. NOTE: Select the resume’s entire body (pressing “CNTRL” key & “A” key simultaneously for PCs) to change all the borders in one step. Step 5: Paste the resume into the body of your email BELOW your signature. NOTE: Your headshot thumbnail is to be no larger than 250 pixels wide & high. Never place a full 8×10 in an email. The download on the receipt’s end is near endless. Plus the recipient will more than likely see only one of your large eyes, and then use scroll bars to see other too large proportions of you. Step 7: Copy the thumbnail headshot. Write your best message for what you seek, and why you’re the best at what you do in the body of your email ABOVE your thumbnail headshot & resume. NOTE: Write in your VOICE. Step 10: Review for typos, voice, clarity, and then send! You just beat spam algorithms. When the receiver opens your email they are forced to view your headshot thumbnail & resume that is in the body of your email. NOTE: Gmail & Outlook users may create the table resume within the email itself without doing the copy and paste from a file option. But it’s best to always have an email version on file, with the proper bowser widow size width resume (5 and ½ to 6 inches). Smart marketers know well how to nab your attention making the sale while exploiting personal interests. Actors can hold casting’s attention and score an audition (or talent representation) with résumés, leveraging successful techniques modern marketers exploit. Having one-résumé-fits-all-needs is poor actor-marketing. Legit casting and agents have no interest in your commercial, voice-over, and extra history. In contrast, commercial casting and agents care little for your playing the Bard on the boards in Barrington, VT.
As marketers target individual consumer’s interests so must an actor. That begins with the actor’s résumés. Lead with your most impressive employment field. For some actors this will be screen credits (TV, Film & New Media). For other actors more impressive areas of work may be New York Theater, or Regional Theater, or Educational Theater. Acting for the box (Movie screen, TV, computer, and smart phone) is a learned technique vastly differing from playing to a 2,800 seat cavern. Screen casting immediately wants to know viewing your résumé if you have the skills of immediate acting intimacy. Sell that history first. The actor’s theatrical résumé begins with their strongest category of their best principal, theatrical history. Commercial & voice-over casting and representation are generally tended by the same family of employment gate keepers. A casting brood where look, (sound for voice-over), and type trumps talent. Begin with the more prestigious commercial credits, followed by voice-over credits. Add several screen credits, followed by a smattering of prestigious theatrical credits. Adding non-commercial acting credits displays you’re not just a face/type that matches a corporation’s narrow wants; these additional credits provide sample history of actual acting. Extra & background casting is based on look. Begin your extra / background résumé with your best extra credits. NOTE: With Legit casting and talent representation, the pompous elevation of an extra credit to ‘Featured Extra’ is a red flag flapping actor insecurity; lack of honesty; and that you’re a tin-foil-hat-wearing extra squirreling savings for a never-to-be star on the Hollywood Walk of Fame. NEVER claim to be a ‘Featured Extra!’ It’s a nonsuch delineation. Non-special skills such as running, driving, jump-rope skipping, diving and similar ilk are best added to commercial & extra résumés. Commercial and extras casting cast first by look, second by ‘skill’ the client and/or director demands. On a Legit résumé for principal work the prior, superfluous ‘special’ skills are not special skills to be included. Legit résumés special skills include; dialects, languages, instruments played, stage/screen combat skills, dance skills, vocal skills, and gymnastics. For principal casting projects that specify a special skill; make the receiver of your inquiry aware you possess that skill. Don’t weigh-down a Legit principal résumé with every ‘skill’ imaginable making the bottom of your résumé as verbose as War & Peace. IMPORTANT: There’s an industry standard for actor résumé formatting (layout, and what’s to be included). A format that allows easier reading of your credentials by strangers. A résumé format meeting requirements utilized by talent representation, and well-established actors. Information on How to Format Your Résumé to Industry Standard. Always have the above five actor résumés ready. When a principal, film audition notice comes your way, send your Film, TV & New Media industry-formatted résumé. Same as for the other work areas of acting; target your history to opportunity. You’ll leap ahead of the competition with your marketing. I guarantee it. One Christmas I and my partner (the talent agency owner) were on a plane heading to my parent’s Florida home. Because of booking the flight at last minute I was sitting next to a jock-type who was watching football on the Jet Blue in-flight TV while my partner was sitting one row behind watching, as is his custom, The Girls Next Door (Oh good God… he’ll never be CNN material). When we got off the flight my other half and I began speaking about a work issue at his agency as we walked through the quiet, yet swank, Sarasota terminal. While at the rental car desk, behind us came a voice. “Excuse me; I heard you were an agent?” There’s no escape even in Death’s sunny waiting room. We turned ‘round and it was the football-watching, jock-type who I had been sitting next to for the past two hours. He was a New York based actor visiting his snowbird Sarasota parents as well. He ignored me, not knowing what I do for cha-ching, and focused on my other half. He was polite, introduced his smiling folks… to my partner. Again, I was ignored. Which is O.K. I’m basically shy (yes, believe it) and love my anonymity. But I’m also a bit of a devil and love to play with human behavior. So after he presented to my partner his business card with his picture and turned to leave I couldn’t help but be mischievous and casually mentioned, “You know you were sitting for the last thousand miles next to a director and casting director.” Ping! I suddenly gained his attention, a parental introduction and of course deemed worthy of his business card. Opportunist? Yes. Wrong? Yes and no. This actor knew that here was an opportunity to introduce himself to gate keepers (agents and casting directors are nothing more than glorified employment agencies and human resources). He was right to begin a conversation. Where did he go wrong? He would have been smarter had he had his picture and resume with him. A business card with a picture may work for funeral directors and car salesman (you always want a trust-worthy face handling your car and dead) but it has little relevance to agents, directors, casting directors, producers, and writers, anyone who provides work opportunities. It doesn’t help us getting to know the actor as an actor. I’m surprised how many actors do not carry with them, at all times, some form of their picture and resume. That’s your business card! You never know who the hell you’ll run into and where. 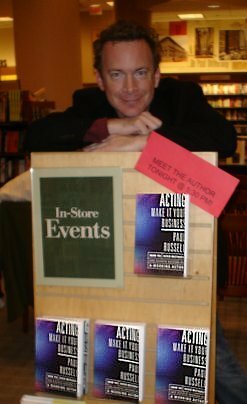 Just this past week I was walking in my suburbia neighborhood on my way to Whole Foods for my morning muffin and yogurt when someone called out “Paul Russell!” It was an actor who had read my book. He went to offer me his contact info but came up empty. Now you may argue, “Well Paul, I can get the person’s contact info and e-mail or I can hard copy them my resume.” Good luck in getting a personal e-mail. Double the good luck chances that the e-mail will be opened or that you’ll be recalled. Now caution note here about running into someone who can help advance your work goals: Talent reps., directors, writers, producers, choreographers, stage managers are the same as you when on the street or at a Starbucks. We’re people. People, possibly like you, who enjoy privacy and anonymity. If you get into a conversation with an industry person who you think can help you in the future in obtaining work, be extremely tactful, polite and respectful of space. And treat us not as objects of use to you but as someone to get to know as a person. Don’t forget that we’re all people, not opportunities. That is so often forgotten. And when we’re treated as a doormat, it’s a big turn-off. I know talent reps who have been accosted by actors as the agents were shopping for underwear, getting their Sunday morning coffee, or sweating in a sauna. If the person you run into asks for your picture and resume, of course give it to them. Don’t ambush. That happened to Alan Alda once in a hospital by a nurse who believed herself to be an actress. It pissed off Mr. Alda so much that he used the occurrence for fodder in a later movie. On my book tour I encountered, in each city, actors who could be runner-ups to Mr. Alda’s nurse-actress. I’d give the free, one-hour seminar on the business and then sign books that attendees generously purchased. People would wait in line for their turn to speak with me and have their copies of my book signed. And without fail, in each city, there were several actors who would wait in line without a book, come to the table hand me their picture and resume then ask me to keep them in mind for future casting. Excuse me? What is most important in the message here is this: Try at all times to keep a picture a resume on you. One that is up-to-date, the picture and resume are stapled together and clean in appearance. Have it in some form; full or reduced to an over-sized postcard easier for constant carry. You may not run into an industry person on the street but there will be many times when you’re needed to be at an audition with very little notice. Sometimes only an hour’s notice. This happens often with film and TV casting. I teach. Students at NYU, privately and as a visiting guest to campuses across the country. In every situation one of the first things I ask (including my weekly NYU students) is, “Who here has their picture and resume, stapled together, ready to hand to me or anyone in the industry you meet on the street who can get you work?” I’m lucky if one hand goes up. And forget about the stapled together request… that would be asking far too much. Not having your business card (i.e. an updated picture and resume) with you as often as possible means that you are losing out on opportunities for future employment. It’s your career. Your opportunities for work lost or won. According to a too large percentage of actors I encounter you can’t act. …possibly according to your résumé, and too many of your actor-acquaintances. You’ll never be a good enough actor to play a lawyer. Nurse. Doctor. Cop. Politician. Any profession beyond that of an actor. An epidemic of your peers foolishly believe that if an actor doesn’t possess a degree for a particular, non-acting profession or own a police uniform, nurse’s scrubs, or lab coat, they won’t be considered by casting for an audition and/or job to play a principal role reflecting the occupation of study and/or dress. If you, as an actor, have more faith in costumes, and non-performing arts’ degrees to get you work as an actor than your story-telling skills to believably portray a role, I recommend thus: excise your acting credits (i.e. speaking principals) from your résumé. You believe acting doesn’t matter. That same confusion of message occurs when an acting resume contains a non-arts related degree. When an actor lists on their acting résumé, non-acting degrees and/or costumes, the offense brings up more questions than answers—How serious is this actor as an actor? How late in life did this actor change careers, and why: Unhappy with life? Has a lack of conviction? Or is acting their fantasy? Why is the actor providing irrelevant information to the craft of acting? And how insecure are they in their craft the actor must muddle their acting resume with non-acting degrees? If an actor remains deaf to reason, I ask the actor review actors from Kevin Kline to Harrison Ford. Two, of thousands of thespians who portrayed American presidents. Actors who didn’t possess a political science degree on their résumés. Before Robin Williams played Theodore Roosevelt he burst onto American television in the ’70s as Mork from Ork. Where was his B.S. in Earth and Space Exploration making him suitable to play a visiting alien? I wonder what Anthony Hopkins—who played Hannibal Lector—has listed on his résumé under special skills? I’ve cast many actors as lawyers, medical professionals, law enforcement personnel, politicians, scientists, and writers in principal roles; never did a director demand the actors auditioning hold a degree in the field in which the character worked. Exceptions? Yes. If a project has in its casting breakdown that the role requires the actor have a history within a civilian profession or skill, and you own that history or skill make the casting personnel aware of your specialty. Projects that hire relying more on non-acting skills for profession skills are commercials, screen extras, and industrials. Keep your acting resume relevant to acting. And once hired: just act. Get entertainment industry-standard resume formatting for actors here.